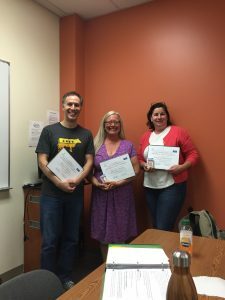 of our Leadership in Edible Education Certificate Program! Leadership in Education Certificate Program Graduates, Summer 2016, (L-R) Brian Gilbert, Barbara Bolles, Patricia Hennessy. 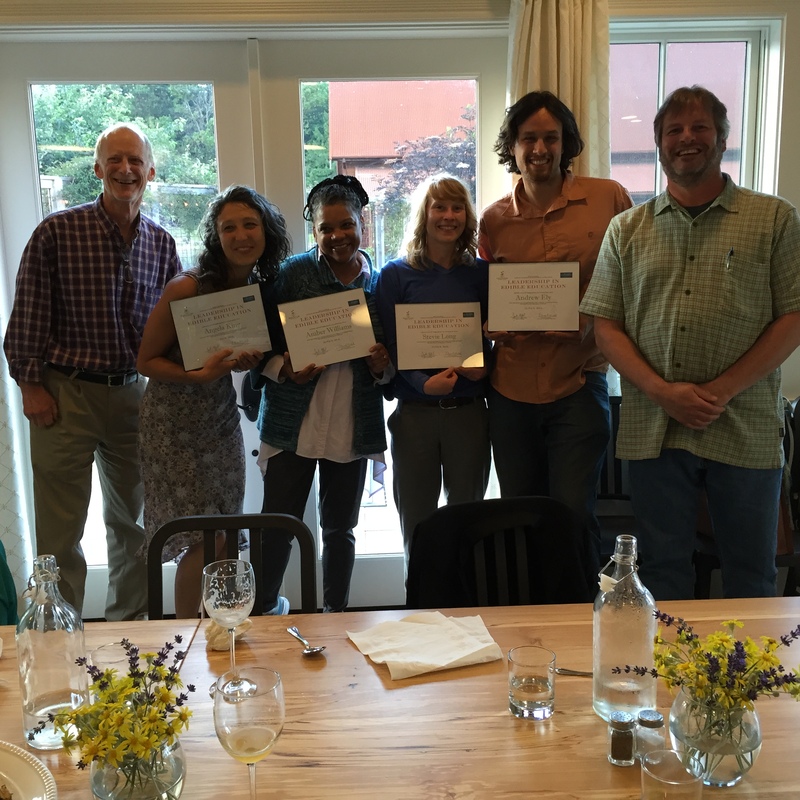 EduCulture is proud to announce our first graduates of Leadership in Edible Education, who completed this program in Spring and Summer 2016. Our inaugural 2015-16 cohort attracted a diverse group of Antioch MAEd students and those working in schools, on instructional farms, non-profit organizations, in the food business. We honor the significant accomplishment of these edible educators, who were the first to complete this EduCulture Certificate Program and Antioch University Concentration, and we celebrate their leadership and work in the field throughout the Puget Sound Region. Cultivating a deep understanding of the interconnecting cycles and systems of life through intimate involvement, students and teachers guide each other to discover the most humane treatment of all living organisms. Growth is naturally nurtured in all academic disciplines, as well as in cooperation and compassion. The border between them becomes penetrable as teaching and learning dissolve into each other. I see a society in which all people, are healthy, are peaceful, are happy. Edible education provides a foundation of knowledge and skills from which individuals are empowered to act on current ecological, economic and social inequities. – Public breakfast and lunch programs utilizing onsite and locally produced foods. – Educational institutions utilizing garden and farm education for all subjects. – Our communities having easy affordable access to culturally relevant wholesome foods. Nature inspires action and a deep connection with our land enabling us to establish relationships in the community through a fundamental sharing of knowledge by engaging in co-education and cross-cultural ideas. As leaders, we collectively inspire children to eat whole foods upon planting and harvesting their own fruits and vegetables and understanding the food process by listening to the rhythm of the seasons and respecting the animals that share their lives to sustain ours. Reconnecting to the natural traditions of food producers and honoring its antiquity allows us to enjoy gratifying nourishment while appreciating our native culture that the seed created. We have the opportunity of daily gratitude to be educational caretakers of the earth by sharing locally produced foods. We provide knowledge of where our food is grown, nurtured, picked, packed, and distributed. We believe in sending ‘good vibes’ & enthusiasm through the tonality and presentation of food, leading to local congregation and global unity, balancing our modern life’s pace with humble simplicity, renewable with every sunrise. When we collectively observe universal truths, explore our individual beliefs of personal identity then together we discover our communities expanding consciousness, evolve within co-creation and begin to taste the essence of our Edible Culture, participating in the celebration of life. Food is associated with both palate and appetite. Palate being the appreciation of taste and flavor and appetite being a natural desire to satisfy a bodily need. Of course, food intersects both. While a palate can be broad, an appetite can be deep or insatiable. Edible education offers limitless possibilities to develop a broad palate around math and science, our health and human services, global citizenship, environmental sustainability, culture, arts and geography among other understandings of who we are and our role in a greater good. Edible education can also satisfy our appetite through allowing us to dive deeper into a particular discipline or subject. While knowledge of a subject matter in and of itself can simply be a tool for creation or destruction, edible education provides a unique opportunity to engage the learner/educator in a broader sense of self and demands a certain level of responsibility in exchange for its full and comprehensive understanding. Therefore, the ultimate purpose of edible education is to inform, inspire and engage all ages and is to be inclusive of learners in pursuit of an education and educators pursuing further learning. Edible education purposely offers a multi-faceted and interdisciplinary approach to an array of issues versus a singular and linear didactic delivery. It intentionally and deliberately instills a sense of accountability to community; local, regional and global all while using food (all facets) as a medium to create and stimulate dialogue, content and understanding of issues that commonly impact all of us as human beings. In a formal setting (pK-12) edible education is reflected through a hands-on tactile problem solving approach. By doing, tasting, sensing and seeing children develop core academic knowledge that demonstrates mastery of one subject and at the same time build bridges between our commonalities and community. Edible education can also be presented in an informal setting (community) as well. In these presentation gardens, kitchens, u-pick farms, CSA’s and other natural settings all offer opportunities for teachable moments. Edible education is a truly revolutionary act. Edible education aims to shift the dominant food culture that has severely impacted the health of ourselves, our communities, and the Earth into one that honors all individuals birthrights to be well; to not only survive but thrive. Edible education seeks to honor the land by teaching sustainable food practices, communities by acknowledging and giving reverence to cultural heritage and native traditions, and ourselves by developing a deep and intuitive connection to the unchangeable truth that food is our medicine. Edible education is the key to healing ourselves, our communities, and mother Earth. A growing awareness of Edible Education around the world is crucial to a deeper understanding of personal, physical, mental, and global well-being. We have for too long denied the importance of understanding that food, what we consider food, and how we source, distribute, price, purchase, and consume that food plays in the role of improving or deteriorating our health and planet. Without greater need for the implementation of edible education, and the understanding of the role food plays in our environment, in our cultural, health, and social justice issues we quite honestly will not have the place to discuss and improve upon it. Food is not only a want but a need for all living things. Now is the time to realize that our old understanding of food and its purpose needs to be uprooted and replanted in a new fertile learning environment. The purpose of Edible Education is to educate and reconnect children and adults alike with the source of their food, with hands on experience through the context of science and nature and the world we live in. Through the process of bringing the garden to the kitchen table and then back to the garden, allows for the integration of practical knowledge and growth of the spirit, which taps into the universal idea that good food brings us all together. This entry was posted in Edible Education, Professional Development by Managing Director. Bookmark the permalink.